Design Indaba 09: young designer Revital Cohen talks about her Life Support project in this seventh movie from Design Indaba conference and expo, which took place in Cape Town last month. Cohen's project, completed while studying at the Royal College of Art in London, envisions animals transformed into medical devices. For example, a retired greyhound could be retrained and used to help a patient dependent on mechanical respiration. In another example, Cohen suggests that a sheep could be genetically altered to perform dialysis for patients with kidney failure. For a glimpse into the minds of the future’s great designers, Design Indaba this year invited the top graduates from design institutions across the world to not only come and experience Design Indaba, but also share their work in Pecha Kucha format. Speaking at the conference were Jon Stam from Design Academy Eindhoven, Sandhya Lalloo from the University of Johannesburg, Revital Cohen from the Royal College of Art in London, Arno Mathies from ECAL Lausanne in Switzerland, Barbara Cilliers from the University of Pretoria and Lauren Mackler from Rhode Island School of Design in the US. This presentation by Revital Cohen, in which she talks about her Life Support Project, was also presented at the Design Indaba Expo. Cohen recently attained a Masters in Design Interactions from the Royal College of Art in London, which followed a BA in Contemporary Furniture Design from Buckinghamshire New University. As a designer and researcher she develops critical objects and provocative scenarios exploring the juxtaposition of the natural with the artificial. Her work spans across various media and includes collaborations with scientists, animal breeders and medical consultants. A pedigreed greyhound is bred by the racing industry. Like his purebred parents, he has long, powerful legs, hypoallergenic fur and a large chest capacity. He will spend the first twelve months of his life being trained to chase a lure. Over the next three to five years the dog spends his days at kennels and is taken racing weekly to make profit for its owners. By the age of five, or earlier, the greyhound retires from the racetracks. Instead of being euthanised (a fate thousands of retired greyhounds suffer each year), the dog is collected by the NHS and goes through complimentary training in order to become a respiratory assistance dog. When training is completed, the greyhound is adopted by a patient dependent on mechanical ventilation. It then begins its second career as a respiratory ‘device’. The greyhound and its new owner develop a relationship of mutual reliance through keeping each other alive. The greyhound is fitted with a harness that converts its lung movement into mechanical ventilation. The harness is non invasive and uses the dog’s rapid chest movement to pump a bellows that pushes air into the patient’s lungs. A greyhound brought up in racing kennels usually suffers from separation anxiety after retirement. As an assistance dog, it is constantly connected to its owner by a trache tube and is never left alone. 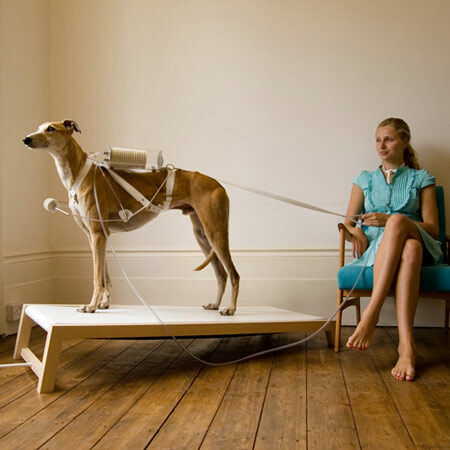 The treadmill, using a mechanical lure that employs the dog’s previous training, functions as the interface and on/off switch. A patient suffering from kidney failure gives a blood sample to the lab, the scientists cut from the patients’ genome the regions that code for blood production (bone marrow tissues), and immune response (the major histocompatibility complex). They then extract the genome from the nucleus of a somatic cell taken from a sheep and substitute the corresponding regions of the sheep’s genome with the DNA cut from the patients’ genome. This recombinant DNA is then inserted into the nucleus of a pre-prepared sheep egg cell. Cell division in the egg is initiated and after a few divisions implanted into the receptive ewe. The surrogate ewe gives birth to the transgenic lamb, which is given to the donor patient. During the day, the dialysis sheep is free to roam in the patient’s back garden, graze to cleanse its kidneys, and drink water containing salt minerals, calcium and glucose. At night, the sheep is placed on a special platform at the patient’s bedside. The transgenic sheep’s kidneys are connected via blood lines to the patient’ s fitsula (a surgicaly enlarged vein). During the night, peristaltic pumps remove waste products from the patient’s blood by pumping it out of the body, through the sheep’s kidney (a natural, organic filtering system) and returning it, cleaned, to the patient. This happens over and over again throughout the night. Each time the “clean” blood is returned to the body, it picks up more waste products from the cells it circulates through, and brings these newly-collected toxins back to the sheep’s kidney to be removed. The sheep urinates the toxins.